It's getting harder and harder to buy a wedding gift these days. So many couples have already lived on their own, so they don't need too much. But that doesn't mean you have to buy another boring present! Here are 10 great wedding gift ideas, along with tips on making your present feel personal and unique. 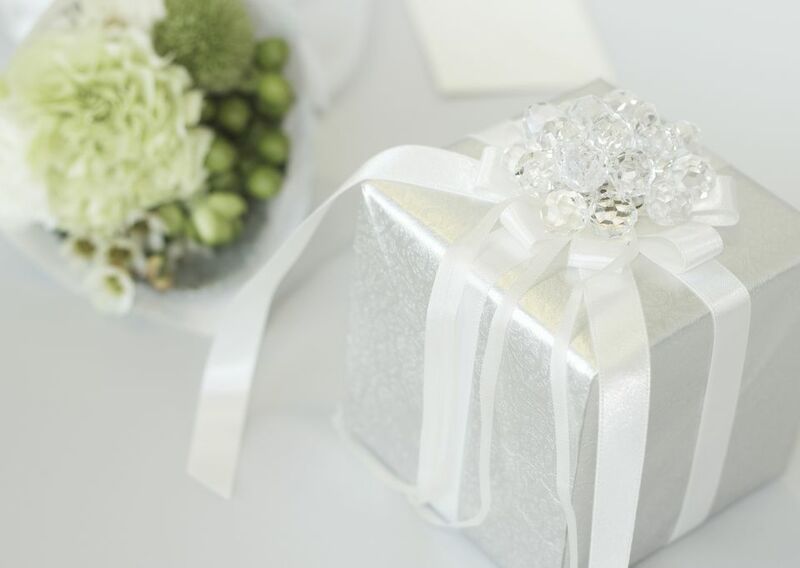 Before you shop, make sure you know the new rules for how much to spend on a wedding gift. Help your newly married friends feel like they're still on their honeymoon with truly luxurious sheets and pillows. They'll make the bed a relaxing and decadent place to be. Choose sheets with an absurdly high thread count and a smooth finish. Include a note that says, "May all your dreams together come true," or be a bit more spicy and write, "Here's to many happy hours spent together in bed." The KitchenAid stand mixer is one of the most requested items on couples' ​wedding registries, and for good reason. Not only is it a very useful tool to have, but it comes in fun colors. Even people who don't cook all that much want the KitchenAid to stand proudly on their counter and accessorize their kitchen. For a more creative and personal touch, include some family baking recipes. If the couple already has the mixer, the pasta roller attachment is phenomenal for making fresh pasta a regular event rather than a special chore. Other attachments include the ice cream maker, a meat grinder, and a citrus juicer. One of the best pieces of marriage advice we know is, "Never stop going on dates together, and treating each other like a king or queen." Help them keep the spark alive, by helping them go on dates during their first year of marriage. Give 3 to 4 pairs of tickets for something the couple enjoys doing together, such as baseball tickets, a new play series at the local theater, or even tickets to the drive-in movie theater. For a diverse couple, mix and match, and introduce them to new experiences. Include a note with the above marriage advice for dating each other long after the wedding day. Sometimes you have every intention of sending a wedding gift right after the wedding, but you get too busy, and life gets away from you. Here's a way of turning a belated gift into something positive. After the honeymoon's over, they'll have returned home to work, and errands, and bills. Take them back to their honeymoon with a gift basket of regional flavors. Many specialty stores will work with you to create a basket of foods from a specific country. Try Murray's ​Caribbean for Island treats, or Zingermans for gifts from Provence or ​Tuscany. Islander Gifts brings home Hawaii, and Cajun Grocer has the flavors of New Orleans. For other US regional food shops, check out the Google directory. With so many couples living on their own before they get married, they often already have too much stuff. But you can still help them invest in their future through wine. Pick one bottle for them to drink now, and get the wine store owner to help you pick out a second bottle that will be great to drink in 10 years. If your budget allows, buy a third bottle for them to drink in 25 to 30 years. Attach notes to each bottle that tell them when to drink it, such as in 10 years. A decade from now, they'll still be remembering what a special friend you are. The couple who has everything and likes to cook probably also has everything they need to cook with. Sure, you could find a new gadget they don't have, but odds are it will probably get used only once a year. Instead, add some spice to their married lives. Food experts recommend replacing your spices annually. So a wedding gift of gourmet and specialty spices will help start them off on the right foot. Penzey's spices, one of my favorite mail-order sources, offers a "Spicy Wedding" gift box, which includes rubs and spices, nestled in bay leaves and cinnamon sticks. The deluxe version also includes a pepper mill and salt shaker. Or, go for the gusto with a big gift crate of 20 spices, the peppermill, and salt shaker. People who'd rather spend their time outdoors are generally bored by typical wedding gifts of china and kitchen gear. So help them out by skipping the big department stores housewares departments, and head straight for the camping gear. Get them a new tent with a tag that says, "Here's to nights under the stars together!" A camping stove is a useful item that many people would like to have, but haven't yet invested in. If your adventurers are less inclined to sleep under the stars in favor of sleeping in a 4-star, you can still encourage their spirit. Opt for matching his n' hers passport cases, or a new piece of luggage. After all, what is marriage but a grand adventure? Sure you could just give a waffle maker or a blender, and the couple would probably like it. But give a more romantic wedding gift by making a "breakfast in bed" package. Along with the appliance, give a breakfast tray, like a small bud vase, and an assortment of miniature jams, jellies, or waffle mixes. The card could something like, "Here's to many lazy Sunday mornings together." Many brides aim to create a wedding scrapbook, but afterwards, they're exhausted and busy with endless thank you notes. So give the wedding gift of memories. Collect their wedding invitation, save-the-date, and any mementos from the wedding itself such as the menu or favor packaging. Add your photos from the wedding or ones from when they were dating. Make a basic scrapbook, and include extra pages so they can add to it. scrapbook, and include extra pages so they can add to it. Not the crafty type? Give a gift certificate to create a custom photo book at Blurb. A friend did a version of this for my wedding, calling it "Nina and Mickey's Marital Bliss Recipe Book." It included pictures of the two of us, and poems, advice, and thoughts on marriage. It's one of my most treasured gifts.